Southwest Missouri is dotted with Mexican restaurants both old and new and big and small, and after we talked to the people who make the magic happen at each restaurant, we learned that it’s all about the love. Love is a pile of freshly made tortilla chips. It’s a deep pool of homemade salsa, and it’s guacamole that’s mixed up right at the table. Love is tortillas that were made by the wrinkled hands of an abuela, and it’s the fall-apart, perfectly seasoned meat that was slow cooked for hours and hours. Most of all, love is what’s evident from the people at each and every restaurant featured in this story. Southwest Missouri is dotted with Mexican restaurants both old and new and big and small, and after we talked to the people who make the magic happen at each restaurant, we learned that it’s all about the love. The love of quality food and feeding people, the love of one’s culture and the even greater love of sharing rich traditions, flavors and recipes with the rest of the world. One dish at a time, restaurant after restaurant, it’s all about the delicious, decadent, just-can’t-get-enough-of-it love. Lucky for you, this love is the kind you can taste for yourself. Dig in. 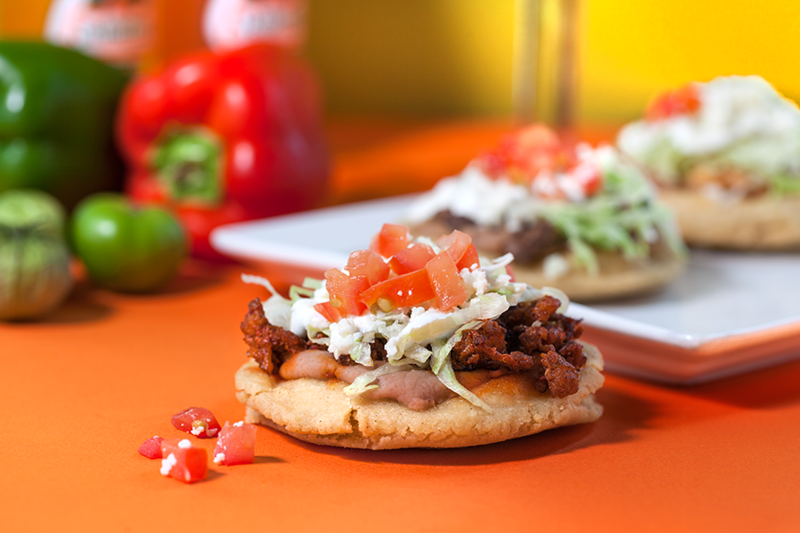 Handmade masa cradles layers of refried beans and beef at Botanas Premier Mexican Restaurant. Hailing from the Mexican state of Querétaro, the Ramirez family opened Botanas Premier Mexican Restaurant (3515 W. 76 Country Blvd., Branson, 417-544-1924) with the goal of sharing made-from-scratch food that’s full of flavor and closer to the style of cuisine they enjoy eating. The packed menu offers a vast and varied array of authentic eats like the traditional sopes, in which refried beans and a choice of meat are cupped in handmade masa boats that are deep-fried to crispy perfection, and the torta, a sizeable sandwich that we love with Botana’s house-made, mildly spicy chorizo. Another can’t-miss meal, the attractively plated camarones tropicales bursts with juicy grilled shrimp and comes with deep-fried plantains, rice subtly sweetened with coconut milk and a bright, fruity salsa combining tomatoes, cilantro, red onions and a touch of honey. And by this we mean the signature chipotle cream sauce at Jose Locos Mexican Restaurant (853 N. Glenstone Ave., Springfield; 417-831-1300; 300 E. Battlefield, Springfield; 417-885-9097). It’s made by Roy Valdovinos, who co-owns the family restaurant with his wife, Maria Valdovinos. A favorite of many customers, the chipotle cream sauce here is a sour cream–based creation that’s kicked up with chipotles, ranch seasonings and a little bit of love, and it can be found accompanying several dishes from the Chicken with Chipotle Cream to the fully loaded Burrito Goyo with beef and beans. Many other sauces here are also homemade (try the hot sauce if you dare! ), as well as all the salsas, guacamole and of course the ooey-gooey cheese dip. And let’s not forget all the house-seasoned, slow-cooked, tender meats. If you want a true treat, try out the owner-recommended El Garocho entree—a delectable combination of scallops and shrimp cooked with green, red and yellow peppers, mushrooms, onions, pineapple and a garlic-butter sauce. The tequila selection here is also worth mentioning with nearly 20 varieties, including a pricey-but-worth-it Don Julio 1942 that sells for $18.50 a shot. Local favorite Tortilleria Perches (1601 W. Sunshine St., Springfield; 417-864-8195) is nailing it. The restaurant combines the sweetest of family success stories with a massive menu of authentic dishes. Jesus Perches and his mother, Maria, got their start in 2005 as a grocery selling Maria’s homemade tortillas and tortilla chips. Public demand for Maria’s recipes eventually became too great for the tiny market, and the family expanded the restaurant into their current full-service space. The slow-cooked carnitas tend to steal the show; they’re lovingly cooked with oranges, garlic and onion and absolutely packed with flavor, then fried. The pork is so tender that a knife is out of the question—simply scoop it onto Tortilleria’s warm white corn tortillas and enjoy. Brunching? The machaca breakfast tacos make one delicious desayuno. 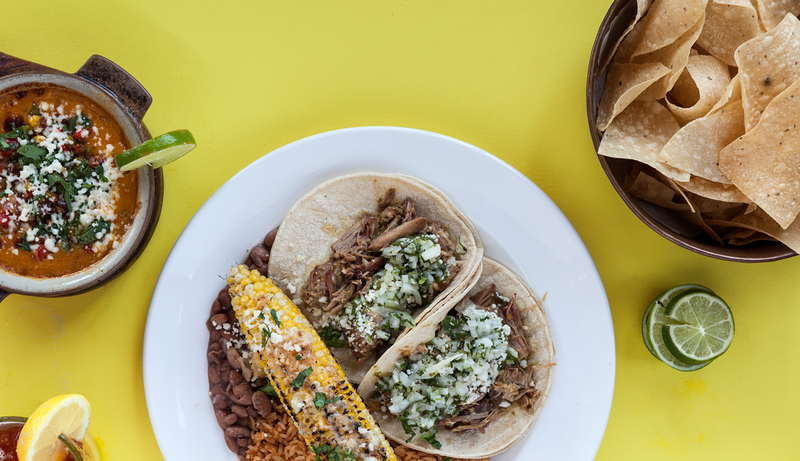 The restaurant’s signature barbacoa is slow-cooked overnight to soak up the perfect blend of secret spices. The tender shredded beef is then scrambled with eggs and served with the soft, warm house tortillas. The really authentic stuff is harder to find: Tortilleria Perches serves a delicious caldo de res, or short rib soup, once a week on Thursdays. Can’t get enough Tortilleria Perches? You’re in luck: They recently purchased space to expand their restaurant and add a full bar, allowing them to infuse their house aguas frescas with liquor. Sounds like a fiesta to us. The pork in the tamales at Iguana Roja is roasted for hours, but it’s so delicious, you’ll devour it in seconds. There’s a process to creating the perfect tamale, and Iguana Roja (107 W. Church St., Ozark, 417-485-8585) has it down to an art. First, large, juicy pork roasts are rubbed with a special house-made seasoning blend and then slow roasted for hours. Next, the pork is pulled into juicy, flavorful strips, and a hefty pile of it is placed in a loving blanket of masa made with maseca (Mexican flour). This combo is then wrapped and rolled into a cornhusk like a cute lil’ pig in a blanket, and it’s steamed to the perfect temperature and served. After you recover from the blow-your-mind deliciousness of your first tamale bite, you’ll happily gobble the rest up and then dream about when you can order the hand-made wonders again. Other favorites here include the not-so-traditional Chili Relleno made with beef, pork, mixed veggies, quinoa, almonds and four cheeses and served with red pepper coulis and cilantro-lime crema. And of course there’s the agave-adobe shrimp stack appetizer made with chilled gulf shrimp, roasted corn and black bean salsa and chunky guac. Mmm, gimme that guac! No matter what you order here, you’ll love the starter of tortilla chips topped with the restaurant’s signature house-made “fairy dust,” a special seasoning blend that includes house-roasted peppers, cumin, annatto seeds and more. Wash it all down with a signature margarita—we love the Iguana Roja marg made with pineapple and vanilla bean–infused tequila and muddled jalapeños. As its name suggests, Big Fat Burritos (3354 S. National Ave., Springfield, 417-890-1500) is the spot for giant, filling, tortilla-wrapped goodness, but don’t expect a greasy, cheesy bomb of a burrito. Instead, the eatery’s friendly owner Jason Childress prefers fresh ingredients on the lighter end of the spectrum that are made-from-scratch each day, like the lime-marinated jicama, bell pepper and onion slaw that serves as a crisp, tangy filler for vegetarian burritos or topper for salads and tostadas. You can customize your order any way you’d like, but whatever you do, don’t miss the succulent, mouthwateringly tender pork pibil. It’s made by briefly sautéing a pork shoulder, which is then braised for at least three hours in a mixture of New Mexico chiles, cumin and coriander, resulting in deep, rich flavor with a slight citrusy aftertaste. Take a bite of tropical flavors with Great American Taco Company’s Hawaiian Chicken taco. Great American Taco Company (2915 E. Battlefield, Springfield, 417-315-8745, greatamericantaco.com) is the kind of place taco lovers dream about. You can get traditional corn hard shell tacos made with chili-infused ground beef or citrus chicken. You can get more exotic tacos, including one stuffed with buffalo shrimp and bleu cheese and drizzled with spicy ranch. You can even mix sweet and savory with the Hawaiian Chicken taco that’s filled with citrus chicken, grilled pineapple, sweet chili sauce, cabbage, bacon, pineapple, white corn hominy salsa and cilantro citrus sour cream. But no matter what you order here, you absolutely must, must, must order a bowl of the Posole soup. A hatch green chili stew made with applewood-shredded pork and white corn hominy, this brothy wonder is the perfect complement to the creative tacos (especially the Hatch Green Chili pork taco with pico and pepper jack). If you’re not in the mood for a taco, there are some tasty taco relatives here, too. We love the zesty chicken quesadilla filled with four cheeses, bacon and citrus chicken and garnished with cilantro citrus sour cream and apple corn pico. Ordinary is probably the last word people use to describe Not’cho Ordinary Taco truck, which is typically posted in Bolivar when it’s not taking its tasty fare to festivals, events and other spots around the region. Each taco boasts bright, punchy combos whipped up by brothers Casey and Corey McTavish. Take, for instance, the Hawaiian Surf and Turf consisting of tender slices of teriyaki-glazed steak and juicy shrimp paired with tangy pineapple chutney, Swiss cheese and subtly spicy aioli. For a spin on a down-home classic, try the Chicken-N-Waffles taco wrapped in a made-to-order waffle shell; order it Country Style, in which the hand-battered fried buttermilk chicken is smothered in rich homemade white gravy and cheddar cheese, or Sweet-N-Spicy with buffalo chicken, maple syrup and powdered sugar. Or, if you’re feeling daring, try a combo of both styles. Wacky? Maybe. Extraordinary? Most definitely. Opened in December of last year by husband-and-wife co-owners Cesar Ortiz and Sandra Gonzalez, Cesar’s Old Mexico (3027 E. Sunshine St., Springfield, 417-881-8252) brings welcome authenticity to the 417-land dining scene. Take the birria tacos, which are common in Jalisco, Cesar’s home state in Mexico. Slowly stewed and flavored with three kinds of dried chiles and other seasonings like cumin and oregano, the moist, distinctly flavored beef is nicely offset in the tacos by chopped onions, fresh cilantro and a little creamy guacamole. The sopes—which come with a choice of meat with beans, shredded lettuce, tomato and a little crumbled cojita cheese cupped in a crispy deep-fried tortilla—are another hit, as are the handmade cheese, bean and pork–stuffed pupusas. These popular treats are served with Salvadoran-style tomato sauce and pickled cabbage for a filling meal. 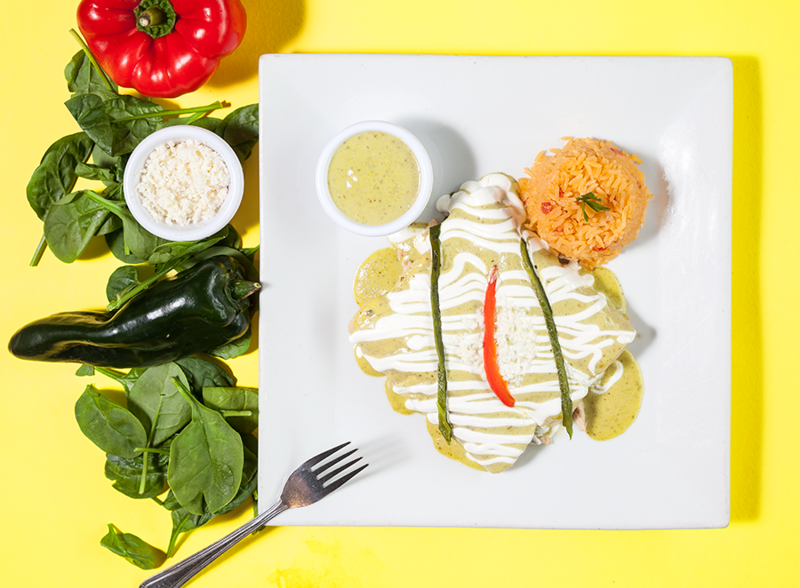 The roasted poblano and spinach cream sauce is icing on top of La Paloma’s chicken-and-spinach enchilada. No matter what you order at La Paloma Mexican Grill (3014 E. Sunshine St., Springfield, 417-719-4484), you can bet that it will weigh on the fancier side of Mexican fare, as things like Swai fish tacos and Steak Feliz with steak, shrimp and the freshest grilled veggies help fill the restaurant’s multi-page menu. Regulars of the east-side eatery swear by the restaurant’s chicken-and-spinach enchiladas, which are lovingly filled with tender grilled chicken and fresh baby spinach before being topped with a creamy roasted poblano and spinach cream sauce, queso fresco, roasted bell peppers and some sour cream for a quick, tangy zip. If you’re out with friends, start the meal off right with the spot’s popular pork nachos featuring homemade chips, plenty of creamy white cheese sauce, grilled onions, tender carnitas and fresh pico di gallo. 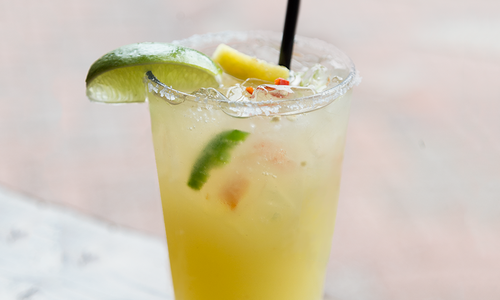 If you’re by on a Friday, be sure to order a $6 sangria—just like the grill’s margaritas, the sangrias here are made with all fresh ingredients including fresh fruit, wine and liquor. 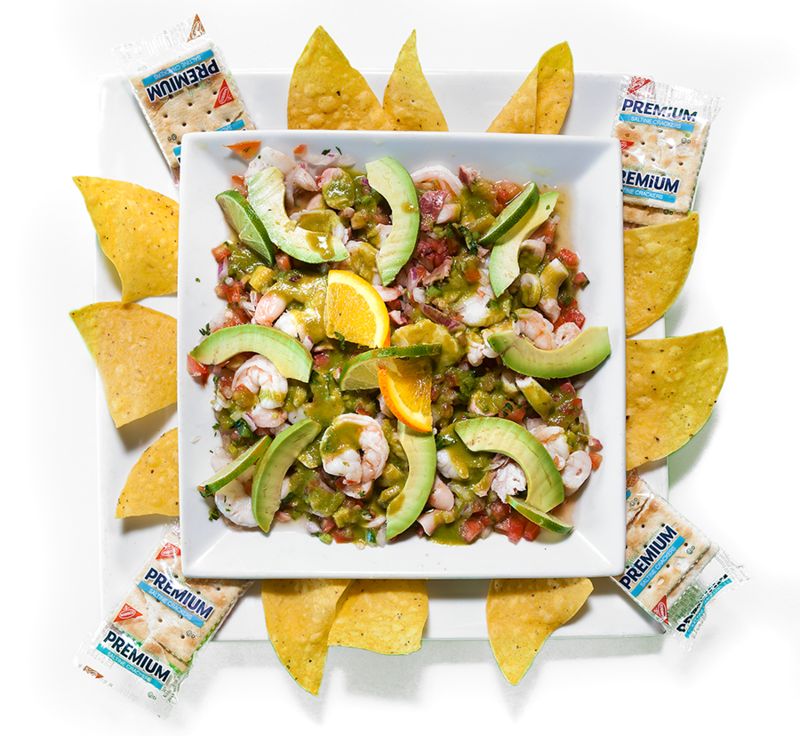 The ceviche at El Patron Mexican Grill is loaded with shrimp, octopus and an array of fresh vegetables. Jesus Torres opened El Patron Mexican Grill (595 Steele St., Seymour, 417-935-2298) in Seymour in January 2015, and the small town’s 2,000-some residents have been happy ever since. After starting a meal with a custom order of guacamole—made to preference tableside—hungry diners enjoy feasting on everything from fajitas and enchiladas to fully loaded burritos and hand-crafted tacos made with chorizo or perfectly tender carne asada. There’s also shrimp and octopus ceviche here, as well as Camarones al Mojo de Ajo—an entrée of decadent shrimp cooked in Mexican garlic sauce. If you’re feeling a little less adventurous on your visit, try the safe-yet-still-delicious favorite Chori Pollo entree featuring a pile of freshly prepared Mexican rice; tender, juicy and seasoned strips of chicken breast; a hefty serving of chorizo and a house-made creamy Mexican cheese sauce that ties it all together. And of course, it’s served with warm tortillas because everything is better when it’s perfectly portable. Leslie’s Mexican Cafe & Bakery (1915 S. Glenstone Ave., Springfield; 417-888-0557) is the real deal. Owner Anabel Verdin opened the itty-bitty cafe in 2015 after several years of demand from the loyal customers at her adjoining Mexican bakery and market. This family-owned and -operated cafe is serving truly authentic dishes to a hungry crowd. For example, their gorditas are hearty pouches handmade from fresh corn masa, then filled with refried beans and fresh-cut meat. The gorditas al pastor are phenomenal, stuffed to the brim with juicy seasoned pork and offering just enough crunch from the chunky masa pouches. Looking for a little more spice? The salsa bar at Leslie’s is a sensory delight. The spicy lineup includes Leslie’s house-made salsas and a number of traditional toppings like Salvadoran curtido, a tangy cabbage-based slaw commonly paired with pupusas. The options vary from week to week, but the salsa bar can include up to 12 options on a good day. The secret behind El Imperial’s fan-favorite chile relleno is a cheesy mozzarella stuffing and light egg white batter. A family-owned eatery with legions of devoted fans earned from more than four decades in business, El Imperial (523 Main St., Cabool, 417-962-3388) is home to one of 417-land’s best chile rellenos. That’s because this version features a gooey mozzarella-stuffed Anaheim pepper that’s coated with an egg white–based batter, making it lighter and crisper than most. It’s also bursting with flavor thanks to a delicious house sauce—a blend of tomatoes, onions, peppers and a touch of savory bacon. Although El Imperial’s gregarious owner Mercedes Munoz spends little time in the kitchen these days, she still steps in to whip up two signature dishes based on her mother’s recipes: the subtly spicy Chile Colorado and well-balanced Chile Verde, which both feature melt-in-your-mouth pork that’s stewed in sauces boasting complex notes courtesy of skillful blends of dried chiles. The fish tacos at the original Purple Burrito (700 S. Campbell Ave., Springfield; 417-863-6688) location are a nautical delight unlike any other. The tacos are served in fresh corn tortillas and positively ooze a creamy homemade tartar sauce. The tortillas are filled with crispy, deep-fried fish, crunchy shredded veggies and a refreshing salsa. Our resident fish taco expert suggests ordering the tacos for dinner Tuesday through Saturday; they taste noticeably better. All four of the 417-land Purple Burrito locations serve the tasty California-style tacos as part of the Lopez family’s original vision to bring California-style Mexican food to Springfield. 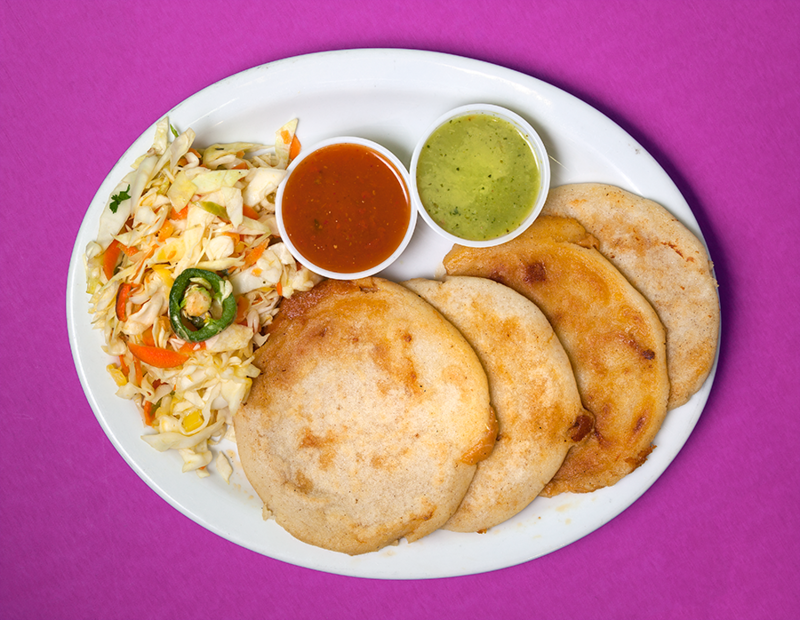 Be prepared for a hearty meal with El Quetzal’s papusas, which come with a variety of fillings. The scrumptious, simply prepared fare at El Quetzal Restaurant & Bakery (129 S. Main St., Carthage, 417-358- 7708) spans numerous cuisines, including Mexican (with dishes like the tender stewed pollo guisado and juicy carne asada), Guatemalan and Salvadoran. For a surprisingly filling meal, order the pupusas, of which owner Mildred Guzman says about 400 are sold in a single weekend. Filled with either loroco (an edible flower) and cheese or a choice of savory meat, the tasty masa pockets come four to a plate for only five bucks. 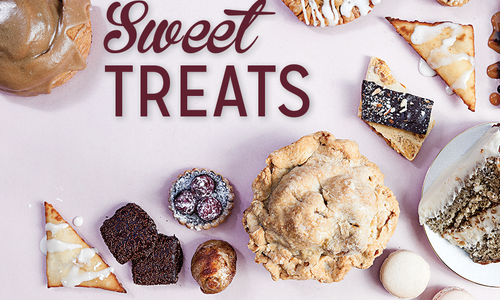 With all the leftover cash in your wallet, grab some goodies to take home. Check out the authentic Latin American products displayed in the front of the restaurant and pick up a few of the Mexican and Guatemalan breads and pastries made fresh every day in the bakery. 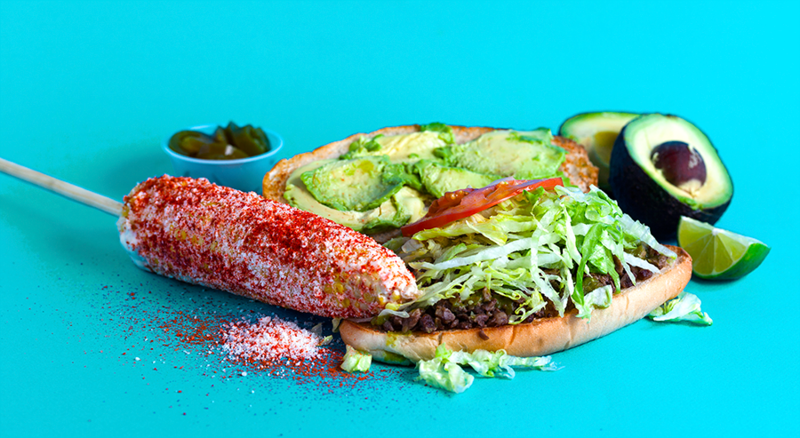 The elotes at Elotes Don Toño pair perfectly with hearty tortas made with freshly baked bread. Imagine how you feel when you’re getting ready for a snazzy evening out on the town. You take what you have, and then you make it the very best it can be with all of the right clothes, jewelry and accessories. This is exactly what Elotes Don Toño (1314 S. Glenstone Ave., Springfield, 417-773-0250) does to prepare its Mexican-style corn on the cob. They start with a basic ear of sweet corn, boil it up right and then dress it to the nines with a sinful blend of mayonnaise, cream, Parmesan cheese and chili powder. Then, voila!, it’s the belle of the ball! This corn is served either on the cob or cut off (depending on your preference), and it makes a great side to any of the food truck’s other favorites, which include asada tacos and Dorinachos—nachos made with finger-staining cheese Doritos instead of the basic, expected and oh-so-boring pile of tortilla chips. If you’re in the mood for a sammie, order a torta made on bread that’s freshly baked daily at Leslie’s Mexican Café & Bakery, or if you’re feeling adventurous, try out the beef tongue that’s slow cooked with garlic, onion and special seasonings. And what’s that? You live near Branson? Well, save your gas: Elotes Don Tono recently opened a second location, Don Toño, at 1056 Indian Point Road. The Hernandez family opened Primas Mexican Grill (multiple 417-land locations) in 2006 after reworking the concept of their first restaurant, La Mexican Kitchen. 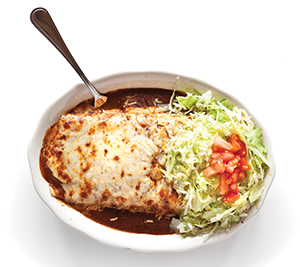 Their tasty legacy dates back to 1989, when the family opened the original La Mexican Kitchen in Fort Smith, Arkansas, after immigrating to the U.S. from Guanauato, Mexico. Today, they’re serving up fresh dishes inspired by the flavors of their hometown. Case in point: the Bistek Norteno, a perfectly zesty, seasoned flank steak. The juicy steak gets a flavor kick from a house seasoning blend, which includes garlic and cumin. Looking for something a little more indulgent? 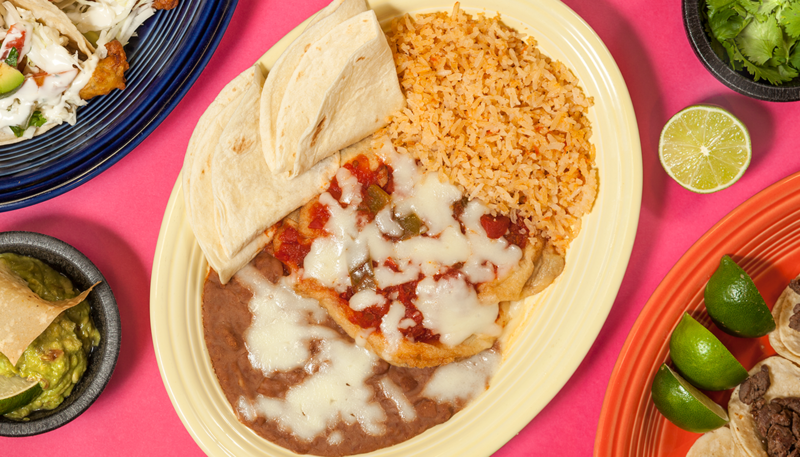 The chili relleno features crispy fried pasilla peppers that are stuffed with seasoned chicken or beef and smothered with zingy ranchero sauce and layers of gooey cheese. Hungry yet? The mountaintop view isn’t the only good-looking thing at Arnie’s Barn. The carnitas tacos make an equally beautiful—and tasty—meal. If you have any trouble deciding what to order at Arnie’s Barn (150 Top of the Rock Rd., Hollister, 417-335-2777), take a gander at the mouthwatering pork shoulder cooking within view of the dining room in the wood-fired rotisserie. That juicy, subtly smoky, lightly caramelized pork, which was marinated in a roasted green chile and tomatillo sauce, will soon make its way into the eatery’s popular carnitas tacos, which are topped with more of the green chile and tomatillo mixture, plus chopped onions, cilantro and queso fresco. Or, you could always go with one of Johnny Morris’ favorites from Big Cedar Lodge and Top of the Rock Executive Chef Mike Halbert’s thoughtful menu: the creamy buttermilk corn chowder, which has a Mexican twist thanks to a mix of red and green peppers, plus poblanos, some cayenne and toppings like herbaceous cilantro and a crisp green chile corn fritter. 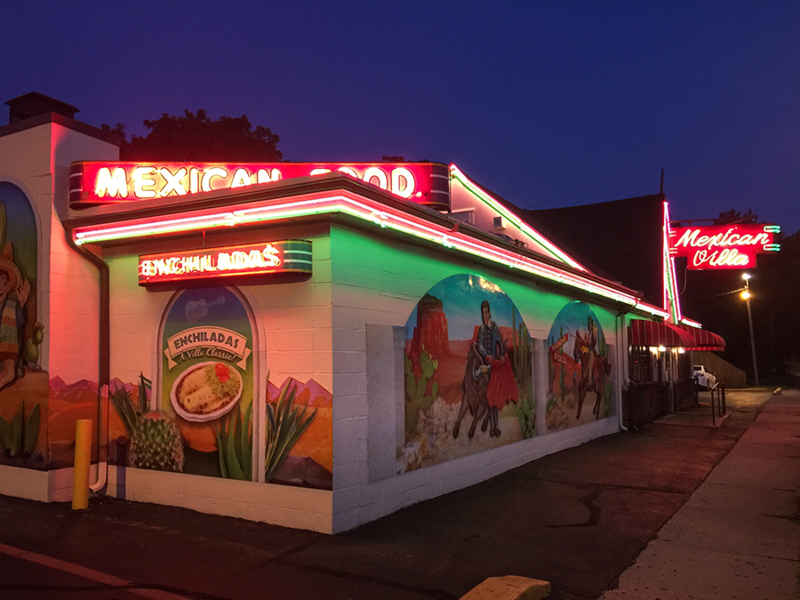 Maria’s Mexican Restaurant (406 South Ave., Springfield; 417-831-9339) has been a go-to spot for hungry downtowners since opening a South Avenue location in 2001. The fried tacos are a definite customer favorite, offering fried taco shells that are perfectly crunchy and just greasy enough. The Gracia is a Maria’s Family Favorite dish with three fried shredded beef tacos, and it’s everything a taco dish should be. The fat shells are absolutely stuffed with juicy, shredded beef and topped with yummy cheese. Patrons on a cheese kick should order the queso de cabra, a gooey appetizer with melted goat-cheese fondue served over Maria’s homemade chorizo. Go nuts dipping the accompanying house tortillas in the indulgent stuff—it’s a crowd-pleaser. You’ll find a combination of authentic Mexican food and original recipes at Acambaro Mexican Restaurant (505 Plaza Dr., Monett, 417-354-8408). Take a bite of their “little kisses,” also known as Besitos Carambas, and feel a light, toasty crunch as you bite into savory shrimp with a bit of a kick. To create this original appetizer, Acambaro’s chefs take eight jumbo shrimp and stuff each one into a fresh, red jalapeño pepper. Hot, melted mozzarella cheese is poured into the jalapeños, and the melty cheese slides around the shrimp until it settles. After the jalapeño bites are frozen, they’re covered on all sides in gooey breading with the help of an egg and flour combination and fried until golden and crisp. Served hot with guacamole, sour cream and chili con queso, these little kisses are sure to bring some spice to the table before your meal arrives. 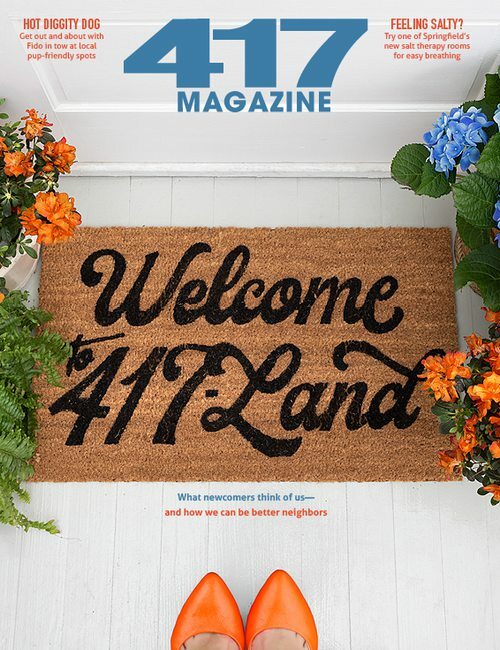 Looking for a more authentic experience? Try the carne asada from the lunch menu. These steak tacos are a popular dish in Mexico made with grilled steak, fresh onions and cilantro in stacked corn tortillas topped with tomato sauce and lime for a tangy taste. You can request beef tongue or Mexican sausage instead of steak and add hot sauce to make a more traditional meal. 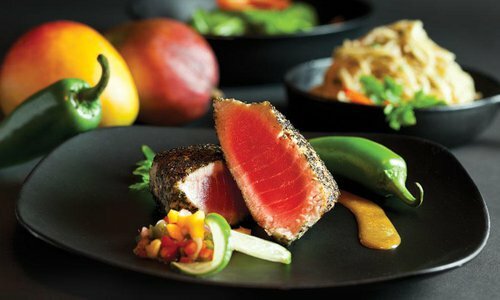 The restaurant even incorporates its Mexican tradition in the presentation of some of its dinner options. 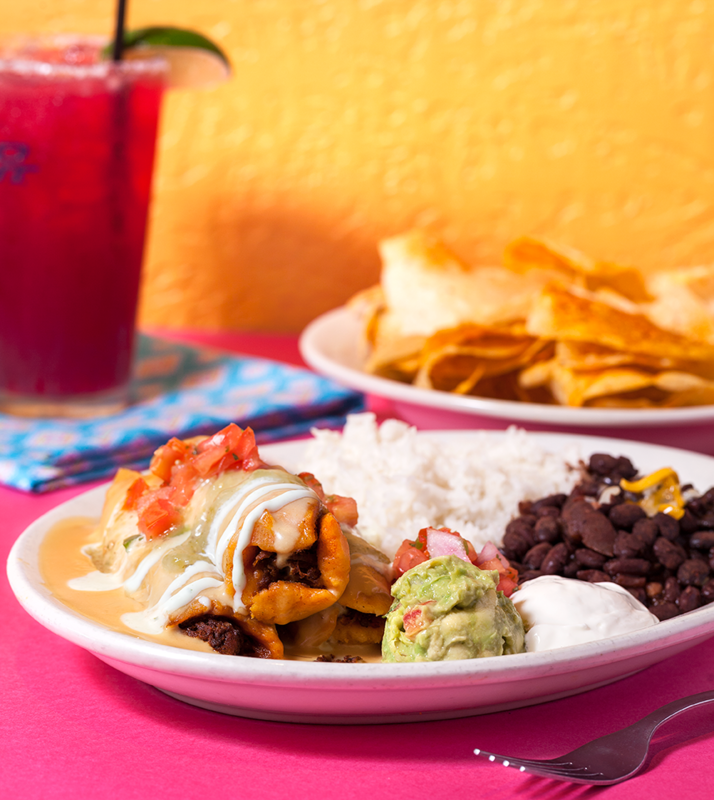 If you order the Bandera, you’ll find yourself staring down at the green, white and red Mexican Flag on your plate. To achieve this creative visual, chefs place three large enchiladas side by side, one with beef topped with salsa verde, another with chicken topped with sour cream and the last with cheese topped with red ranchera sauce. The same employees have worked at the restaurant for years making meals like these, so you’re sure to have the same yummy experience every time you stop in. 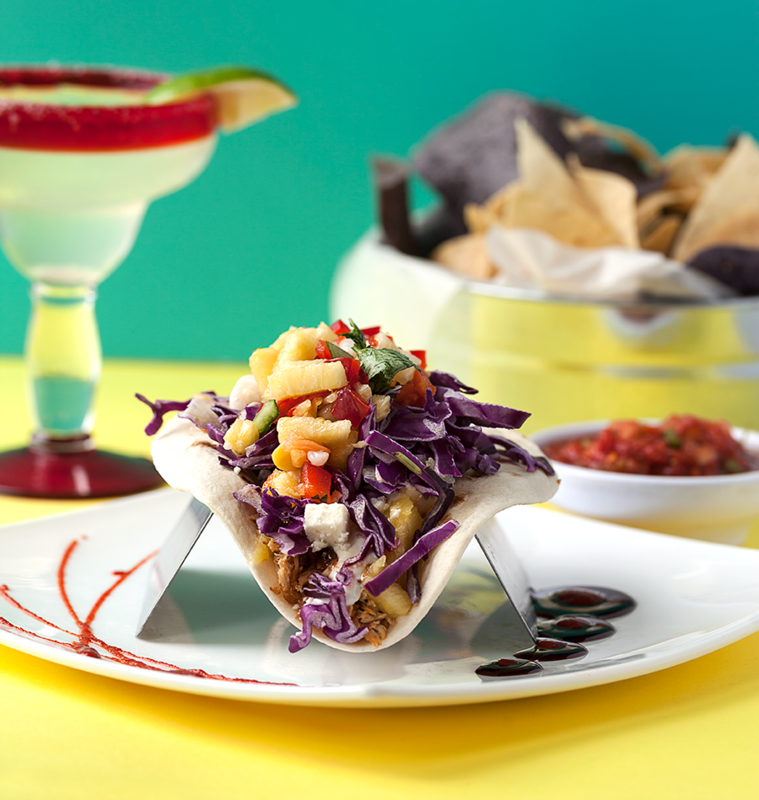 It’s hard to share the delicious ahi tuna taco appetizer from Cantina Laredo. 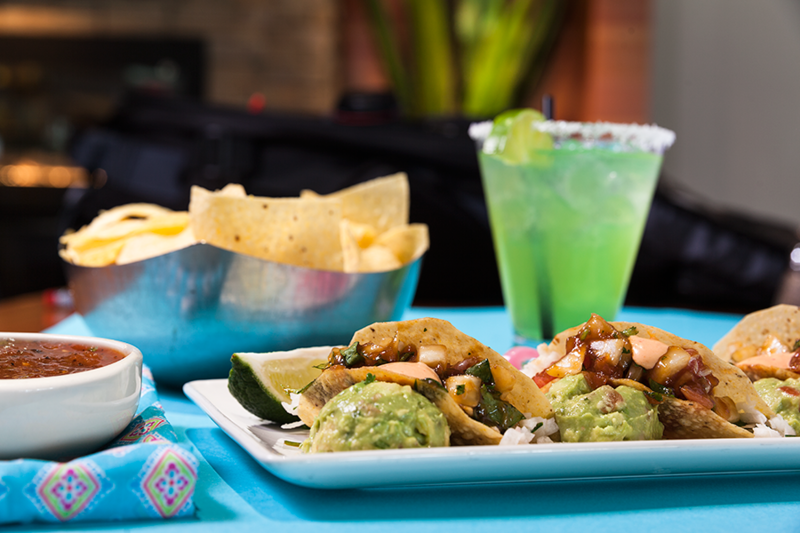 Served three to a plate, sprinkled with cilantro and resting in small dollops of fresh guacamole, the colorful, mouth-watering ahi tuna taco appetizer at Cantina Laredo (4109 S. National Ave., Springfield, 417-881-7200; 1001 Branson Landing Blvd., Branson, 417-334-6062) may be 417-land’s prettiest platter of tacos. But this dish’s merits don’t stop there: The tacos’ lightly marinated sushi-grade ahi tuna pairs well with a touch of creamy chipotle aioli, tangy pickled onions and a crunchy jicama slaw. The enchilada de avocado is another nicely balanced plate. Avocado wedges, melty Monterey Jack, some poblano peppers and chopped artichoke hearts fill the enchiladas, which are topped with a drizzle of cool sour cream, some cooked red pepper and green tomatillo sauce, adding a nice zing to this vegetarian, gluten-free dish. I get tired of people complaining that Mexican Villa is not Mexican food. It may not be the most authentic Mexican food, but who cares? Really? Why do you care? Does its TexOzarkMex style of food serve thousands of happy 417-landers every year? Yes. Does it have a historical value with people? Yes. Does its hot sauce make you feel like you just licked the surface of the sun? Yes. Minus the scalded tongue, those are all good things. I’ll be honest. I prefer stuff like birria from Old Mexico and carnitas from Tortilleria Perches, but once a year I will dominate a couple of crunchy tacos from the Villa. And you best believe I douse those tacos in that bitingly sweet taco sauce that Villa makes. I even keep a bottle of that sugary sauce in my fridge. You have two types of Villa people. You are either a Burrito Enchilada Style or a Sancho Enchilada Style. If you are not familiar, the only difference is the Sancho does not have refried beans. It’s clearly the superior option. Hands down. 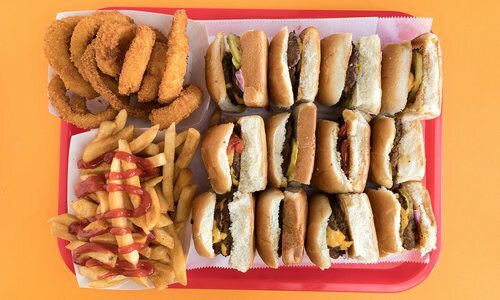 Fat confession: You can get a half order, but I never do. I’m selfish. Deal with it. I get a full order, eat it all and then hate myself. When the Sancho arrives, the only healthy-looking thing is the sprinkle of shredded lettuce. Matter of fact, the lettuce is the only crunchy texture in this dish. It’s a big plate of ooey gooey delicious mush. And that may not sound appetizing to you, but oh man, it’s so good. I love it. I love the Villa, and I don’t care who knows it. The Best Sip of Tequila in 417-land… Almost. If you’re looking to taste a variety of tequila, Maria’s Mexican Restaurant (406 South Ave., Springfield, 417-831-9339, mariasdowntown.com) is the place to go. With a tequila menu that would better be described as a small book and a collection of more than 200 varieties behind the bar, the restaurant’s offerings easily measure up as the best around. And since we’re always interested in things related to liquor and—more importantly—things that give us an excuse to drink liquor during the middle of the day, we decided to stop by Maria’s for lunch on a recent Thursday and have a shot. Looking for some company, we talked to a friend of a friend who owns a liquor store and asked him to hook us up with a local tequila pro. He led us to Jake Frericks. The second Frericks showed up at Maria’s, he started spitting out facts about what makes a good bottle of tequila. “You always want to look for tequila that’s 100 percent agave,” Frericks says. Later, Chris Guest, who co-owns Maria’s Mexican Restaurant with his wife Maria and her family, shared the same information—true tequila is made from the blue agave plant, and varieties that don’t use 100 percent agave use grain alcohols and other fillers, which is bad. After a little more chitchat over chips and salsa, we decided to get down to business and attempted to order the most expensive shot Maria’s offers… and then our server warned us that it would be $195. “Okay, well, what would be your best shot that isn’t going to cost the magazine such a big hunk of my paycheck?” I asked. 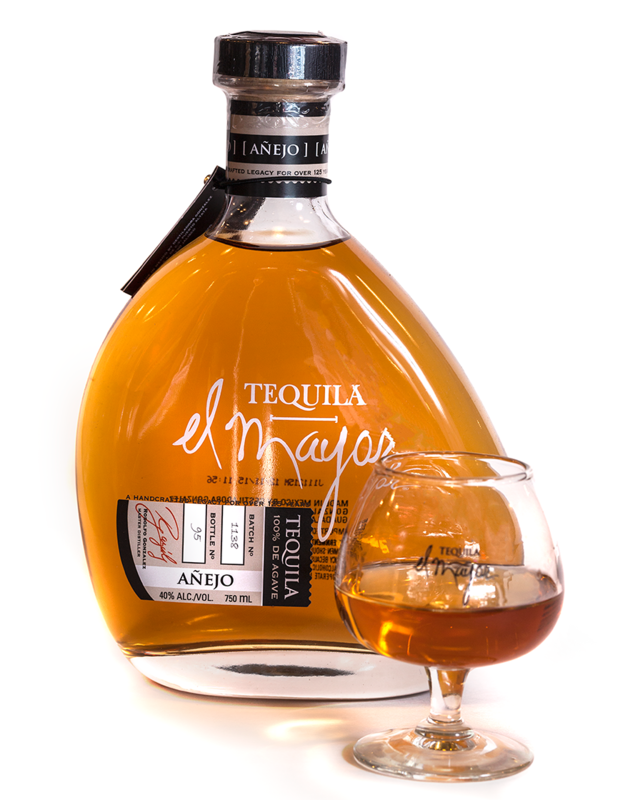 And that’s when we settled on a shot of the El Mayor Anejo, which was recommended by the owner and bartender as one of the best for its $17.95-per-shot price point. These days, more cuisines are represented in grocery store aisles than ever before. 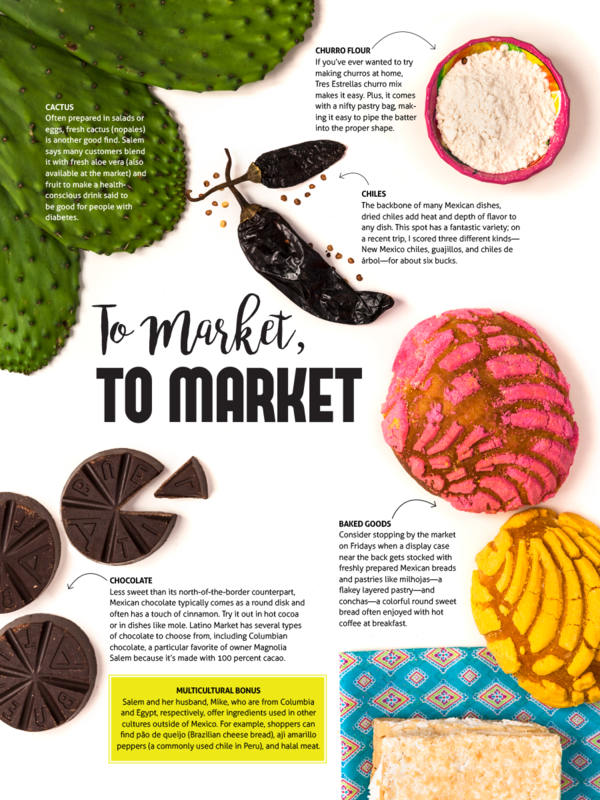 But if you’re attempting an authentic Mexican menu, head to your local Latin market for a deeper selection than the typical neighborhood store. Chock-full of an eye-popping array of great Mexican products at good prices, Latino Market (1661 E. St. Louis St., Springfield, 417-831-4227) is one such great local resource and has been around for nearly 20 years. Here are some fun, flavorful finds for your pantry.